We continue our series of Arsenal’s name changes by explaining what happened following the move to Highbury. 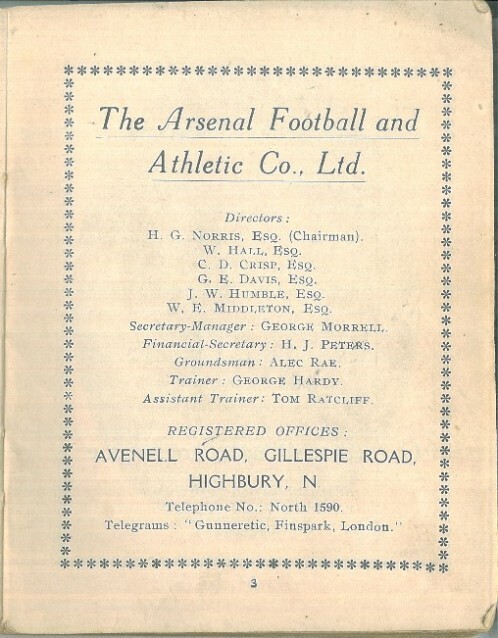 By March / April 1914 the Arsenal board had decided that it was time to change the name. As mentioned in the last article, the club had a name registered with the Joint Stock Companies – The Woolwich Arsenal Football And Athletic Company Limited – and one with the Football League – Woolwich Arsenal. At this point it was the latter name that was changed, to The Arsenal. The Daily Mirror and Islington Daily Gazette both reported the news on 6 April 1914, with the Daily Mirror confirming the actual date of the name change being 4 April. As for the name registered with Companies House, this is a bit more confusing. This was not changed until April 1915. However, the club started used a different name on its matchday programmes and handbook before this date. 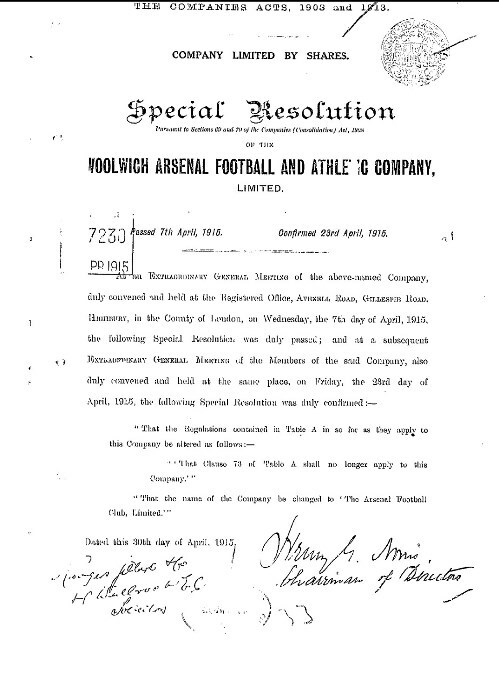 This official document that was completed by secretary-manager George Morrell in March 1915 shows that to the Joint Stock Companies it was still The Woolwich Arsenal Football And Athletic Company Limited. Thanks to some fine investigative work by Phil Wall, we can confirm the date that the name was actually changed with the Board of Trade and Joint Stock Companies. And even that wasn’t as simple as it should have been. There was a procedure in place whereby to change the name of a corporation, a resolution has to be announced and passed at a board meeting within two weeks. 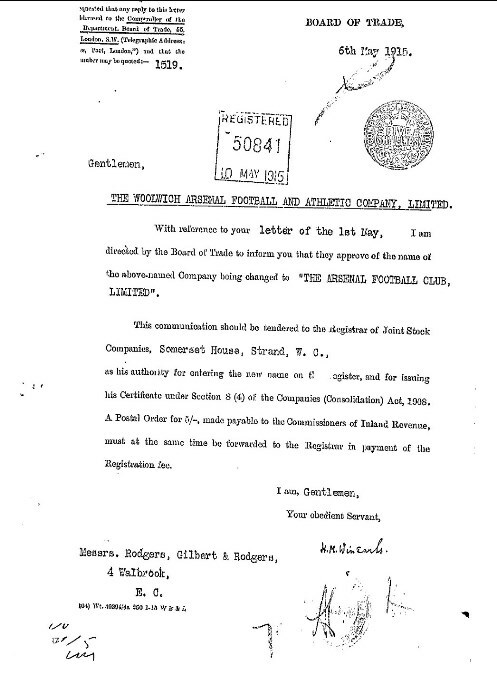 On 27 February 1915 an announcement of a special resolution to change its name to “The Arsenal Football Club, Limited” was debated and accepted by the board on 16 March 1915. However the gap between the two meetings was just a bit too long for it to comply with the Companies Act and so on 29th March 1915, secretary‑manager George Morrell, announced that an EGM was to be held on 7th April 1915, at which it was again proposed that the club should change its name. On Friday 23rd April 1915 at noon, at the club’s offices, the Board held a further EGM and finally passed the resolution. 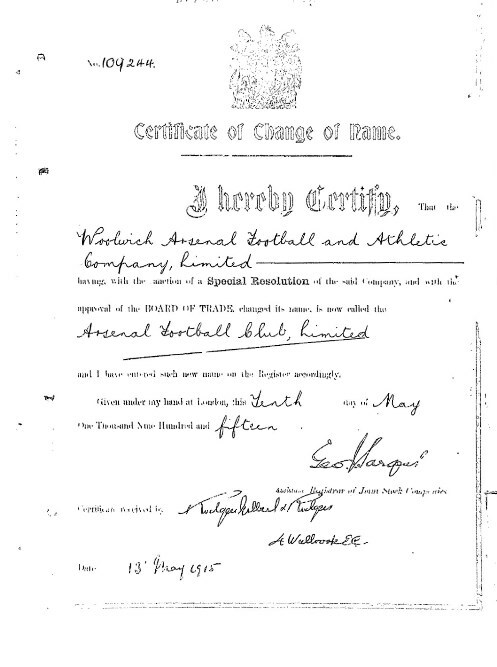 Following the formalities with the Board of Trade and Joint Stock Companies the club’s official name was changed to “The Arsenal Football Club, Limited” on 10 May 1915. By this time Morrell had left the club. With competitive football suspended due to the escalation of the First World War Woolwich Arsenal was no more, superseded by The Arsenal Football Club and The Arsenal Football Club Limited. In the next part we dispel a long-standing myth.